NEUSPEED Hi-Flo Intercooler Pipe - Dezod Motorsports Inc - Home of the automotive performance enthusiast since 2002. NEUSPEED’s new Hi-Flo Intercooler Pipe Conversion replaces the OE smashed and kinked plastic pipe located between the factory intercooler and throttle body. Full diameter all the way through and without any unnecessary bends, the Hi-Flo Intercooler Pipe is a must for any “chipped”or highly modified engine. 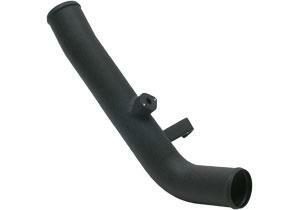 The Intercooler Pipe delivers much better air flow for greater efficiency. Along with NEUSPEED’s Hi-Flo Turbo Discharge Conversion Kit, this part removes the last restriction on the discharge side of the turbo charger plumbing. Simple bolt-on part with no modifications to the vehicle.